I got to meet the sweetheart behind the indie brand Chaos & Crocodiles last summer in Vegas, and slightly before I went, I was lucky enough to get my hands on a pre-order of the Secret Agent Collection, a set of 10 holographic polishes that came in a gold-foiled cardboard box with a foam insert. Frankly, it was fantastic. In October, with my alma mater's Homecoming fast approaching, I decided to pull out Subterfuge (gold) and Sleeper Cell (blue) in a great homage to my school's colors. Now, since I'm not the best at nail art, I knew it had to be simple and what looks amazing but is simple? NAIL VINYLS! I had received a bunch of nail vinyls from KBShimmer, so I chose a scalloped lines design and decided to just go crazy on my accent nail. Now because I was in a huge rush, I decided to top my nails with a gel top coat (cured in a LED lamp) which caused a little wrinkling but nothing terrible. For Subterfuge and Sleeper Cell, I used 2 coats of polish for both. HELLO HOLO. I was a huge fan of this manicure and ended up wearing it for days. In the shade, the holo disappeared but at least you can see the scalloped design better (and the wrinkling). Either way, I was a happy camper and will definitely be repeating this combination for Homecoming 2015. It helps that I live in the same town that I went to college in, hah! 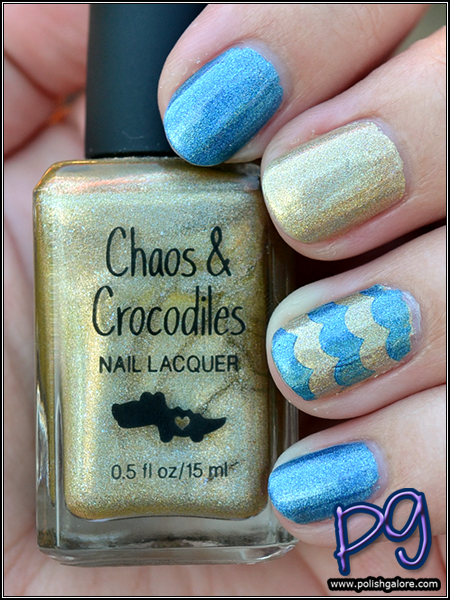 Chaos & Crocodiles can be purchased on her website. Prices range from $10 to $12.50. You can like her on Facebook, follow on Twitter and follow on Instagram as well. Thank you! I'm so glad I bought all these when I did! such wonderful manis with these pretty polishes! Oh wow, don't these look STUNNING together?! Oh boy!! Such pretty!! Even in the shade they are still pretty! These are SO, SO, SO GORGEOUS! <3 I neeeeeed them. THAT HOLO. =O I also love the brand name, too cute! 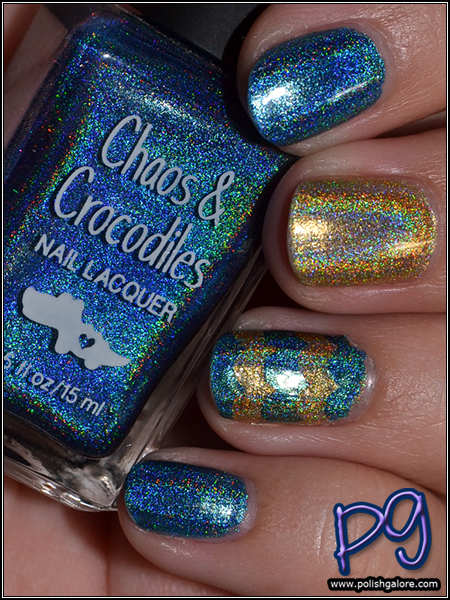 I've never heard of this brand, but holy wow, that holo is amazing! 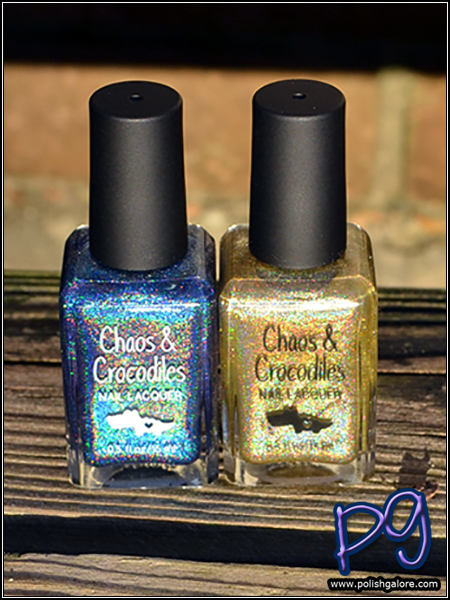 Ooh... those Holos are gorgeous... I love it.